There may never a more important, life-changing win for any pro surfer as Andy Irons’ today (September 3, 2010) at the Billabong Pro Teahupoo against CJ Hobgood. We all know how important contest surfing is to Andy and his psyche and it’s honestly a relief to see his energy channeled in the winning direction because it could have easily gone the other way. Wave after wave Andy grabbed his rail and laid back into the arms of Teahupoo and he was rewarded. 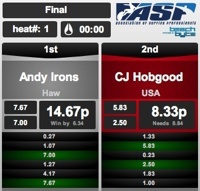 He edged Kelly Slater in the semi’s and then outscored CJ Hobgood 14.67 to 8.33 in head-high surf. CJ was visibly shaken with his second place finish. “I’ve been in four finals here and I never remember the second place finishes,” he said. “I have no one to blame but myself. I had good waves that I could have gotten a score on. . . I wanted to pack them harder than I should have. I didn’t have any breakout heats on my way here. My feeling was my that this was my heat and I’m going to pack the 9s. I was trying to get deeper on my waves and I got too deep. . . if I would have come out of one of those it would have been a different story. We just hope Andy can let this win keep him pointed in the right direction because Trestles in coming. Follow the jump for the complete results and official word from the ASP. Pictured: Andy Irons (HAW), 32, past three-time ASP World Champion, collected his 20th elite tour victory today, besting C.J. 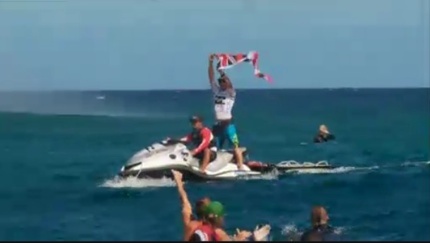 Hobgood (USA), 31, to claim the Billabong Pro Tahiti.